6sqft’s ongoing series Apartment Living 101 is aimed at helping New Yorkers navigate the challenges of creating a happy home in the big city. This week, we cover everything you need to consider when raising chickens in the city. 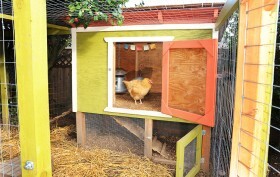 In a city where simply finding a balcony large enough for a pot of basil can be a challenge, one may be surprised to discover that chicken coops can be found across all five boroughs. Chickens were once primarily kept by older city residents, including many who come from places in the world where a backyard supply of fresh eggs is taken for granted. More recently, everyone from Park Slope housewives to Bushwick hipsters appears to be embracing the backyard chicken craze.